Waking up on Saturday morning in San Francisco, we had hoped that the weather would have turned for the better, even if the weatherman says otherwise. Opening the blinds to look outside gave us a false hope, there was sun out! As we scurried to make it out before it vanished, we just so happened to make it out in time for a pretty impressive five minute downpour. Yea, it was sweet. So, there we are, fresh off of our first bus and making our way to the next when it just pours out of nowhere. Having been soaked in the first 10 seconds of it, I get out my umbrella to fend off any other wetness that is falling from the sky. Then, we reach our bus stop and wait under an overhang with what had to be three dozen Asians and me, the lone white guy. After watching one bus get filled and pass us by we made sure to get on the next one. The thing about these bus routes is that they go right through Chinatown and they are packed. Probably the most crowded bus that I’ve been on in a long time. But, just like clockwork, once it reaches Chinatown, it filters out really fast. Then, a few stops deeper into Chinatown, Jamie and I get off. After trying to find a Dim Sum place that Jamie found online, we settled for a different one that we just happened to see. Again, I’m the only whitey in there, no surprise. 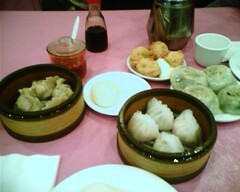 But, the dim sum was good, it was cheap, and Jamie got some noodles to go. Now, after our dim sum, it was off to explore what else Chinatown had to offer. There were a bunch of little shops and things that Jamie liked and I just tried hard not to loose her in the mess of people all over the place. 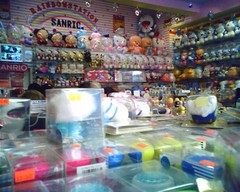 Of course, like she can do, she finds the one crazy store that has like everything Sanrio in it. I made the mistake of stepping into it and then realizing that it was a bit much for me. So, back to the street and I wait. Once we departed the fluffy hell of that store, it was more walking around Chinatown and just soaking it in. The weather was not really raining at this point, just windy and a little chilly. There was really a lot of cool stuff in Chinatown, more than I expected, but man, it was a lot of walking and our day wasn’t even half over yet. Next up, we were beginning our trek over to the Golden Gate Bridge. Seeing that we are creatures of habit, we opted to take public transportation everywhere. 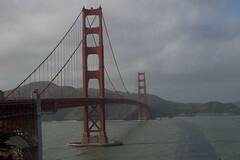 So, we took the bus from Chinatown to the Golden Gate. It only required one transfer and we made it there in pretty good time. Once we arrived it was kinda strange to see the bridge in person. 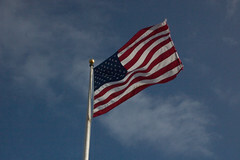 I’ve seen it on TV and documentaries about it many times, but seeing it in person is something different. It was pretty amazing. Also, this is where we ran into the Mayor of Taipei. He was on tour and I guess is running for the President of Taiwan. Interesting stuff. After gawking at the bridge from a distance, we made our journey onto the bridge. After walking off the bridge, Jamie headed to the gift shop and I took some more pictures. Then it was off to catch a bus to Golden Gate Park. Arriving at the park, we had one idea in mind, see the Japanese Tea Gardens. Well… we did… and it was a lot of dead stuff and dirt. Oh, well. But, there was a statue of Francis Scott Key and Jamie read all four sides of it (which was the Star Spangled Banner in full form). Then it was back to the bus, back to downtown, and back to our hotel to figure out what we were going to do for dinner. We wanted it to be something good since we’d been pretty conscious on how much we were spending on food, so we found a well rated Mexican place called Colibri. We had called ahead to see if there was a wait and they said that it was pretty open. Usually, we’d make a reservatoin for something like this, but on short notice it wouldn’t really help us too much. 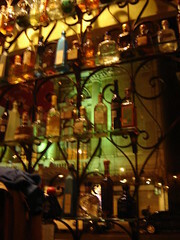 So, with blind faith that we’d be seated in a reasonable amount of time, we headed to Colibri. When we arrived we were told that it would be about a fifteen minute wait, which was half of the wait length we were told on the phone. So, we hung around. About five minutes later we’re seated. Sweet. The food is served ala cart and tapas style, so we loaded up with an appetized, two entrees, some Mexican rice, and potatoes for the white guy ;) That, and a margarita and a beer later, we were out for the night and back to the hotel. The next day was going to be our good weather day and it was already planned… Alcatraz.